My club is VERY quickly turning into a laughing-stock. Yet another scandal means that we are the joke of English football. No longer are Manchester City and Newcastle United the brunt of all jokes – we are. 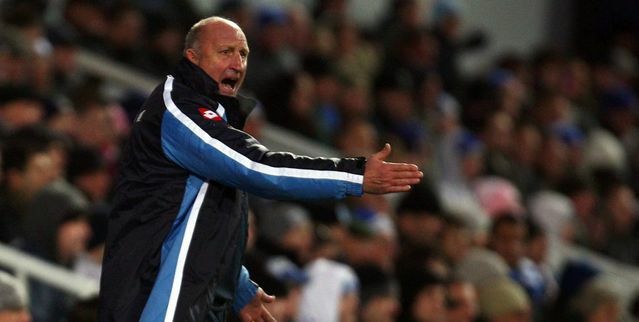 I started writing this post when Paul Hart was appointed and by now he’s moved on! I don’t blame the club for this one actually. You could see after 2 games that he wanted ‘effective football’ and the fans didn’t like what they saw – I’ve never seen the R’s booed off the pitch after a victory before but a combination of bizarre substitutions and tactical suicide meat Paul Hart was fighting an uphill battle. Magilton had us playing some fantasic football but lost the dressing room. Once it’s gone, you can’t get it back. So, who next? Would any respectable manager take the ‘challenge’? I would personally like to see a proven manager, with a reputation for passing football. Alan Curbishly fits that bill but I can’t see him working with our owners – afterall, that’s what saw him leave West Ham. My money would be on a return for Gigi Di Canio in the summer. Wow. What a saga. Is she? Isn’t she? The wife and I didn’t know about the prior ‘debate’ and both remarked that she/he was very ‘manly’. John Inverdale then confirmed our suspicion during the post race analysis on the BBC. She smashed the final and was quickly whisked away for further ‘tests’. Someone in the office did say “how hard can it be? whip down her strides and check whether she has meat and 2 veg!”. Many are probably thinking the same but I heard a really interesting account of the ‘process’ following a BBC interview after the race. The process is delicate. Caster has been bought up a girl, she believes she’s a girl – why wouldn’t she? The interviewee (an IAAF governer) remarked that this case is unlike a drug cheat – where you can single out the individual for cheating and disqualify them, taking away their medal. The Caster situation is delicate in that DNA tests may prove she was/is a man. The difficult task is managing the athlete during what must be the hardest time in their life. Dealing with the consequences and coming to terms with such a life changing discovery cannot be easy. So, after a hero’s welcome when she arrived back in South Africa (where she displayed even more manly characteristics) they decided whisk her away, whack on a bit of slap and make her more ‘feminine’ for the cover of ‘YOU’ magazine. Amazing. I’m amazed by the whole story. What are your thoughts? Man? Woman? Either way, ‘it’s’ a bloody good runner! Right, so Manchester City are signing everyone. I’ve heard numerous conversations on the train, in the office and down the pub where people are trying to pick the City starting eleven. When you look at their squad it’s almost impossible to pick the strongest team.